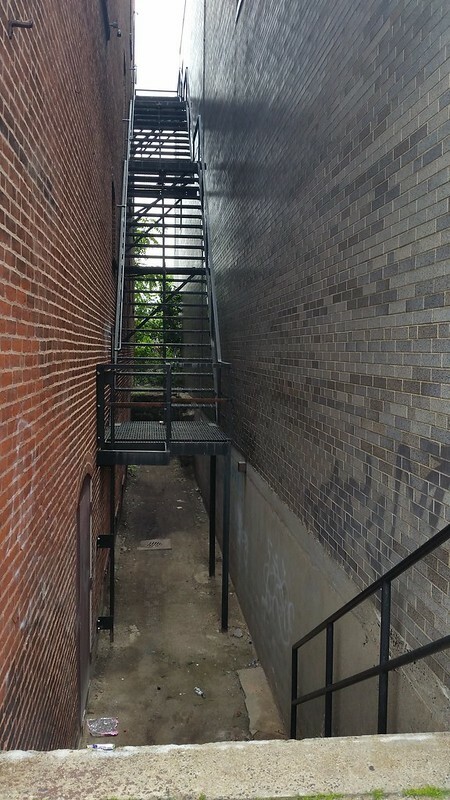 A curious alley that I stumbled upon while playing Ingress. So one thing I really like about playing the game, Ingress, is that it gets met out into and wandering around in various neighborhoods and noticing things or stumbling onto new finds. Today, I played it a bit during a break at work and found new little niches in Lynn that I didn't know existed and was very happy to discover. I look at this alley and I'm sure some--because it is Lynn--think of it in a negative connotation, yet all I could think about was how the kid in me, would love a cool alleyway like this to play in. I could easily see this as a place to explore or play games with other kids. It's next to the Grand Army of the Republic Museum--something else I didn't know existed in the heart of Lynn. I don't think I would have wondered down this particular street if there wasn't something acquire in the game and therein is the fun of the game--you move in the real world, playing a virtual game and finding new real spaces.